Page from the Joseph Tobias Papers; regarding an unauthorized film about Emmett Till, 1960. Recently, we’ve added a new collection to the Emmett Till Archives in DigiNole: FSU’s Digital Repository. The Joseph Tobias Papers consist of the professional papers, case files, and collected publications of Tobias, an attorney based in Chicago, Illinois. The collection is regarding his representation of Mamie Till-Mobley from 1955 to 1960. Documents include case files for Mamie Bradley v. Cowles Magazines, Inc., Vernon C. Meyers, Gardner Cowles, and William Bradford Huie; correspondence on Till-Mobley’s behalf with the NAACP and motion picture studios; and subject files kept by Tobias on Till-Mobley during and after his employment by her. These primary source materials provide a compelling view into the life of Mamie Till-Mobley shortly after the murder of her son Emmett Till. For more information, see the collection’s finding aid. The Emmett Till Archives consists of primary and secondary source material related to the life, murder, and memory of Emmett Louis Till. Florida State University Libraries partners with the Emmett Till Interpretive Center, the Emmett Till Memory Project, and other institutions and private donors to collect, preserve, and provide access to the ongoing story of Emmett Till. The Till Archives includes newspapers, magazines, oral histories, photographs, government records, scholarly literature, creative works, and other materials documenting the Till case and its commemoration, memorialization, and discussion in scholarship and popular culture. 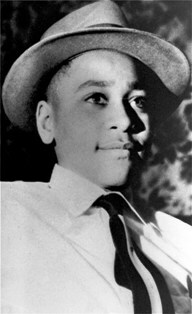 The Florida State University Libraries’ Special Collections and Archives Division and Professor Davis W. Houck are delighted to announce the establishment of what will become the foremost research collection on the life and death of Emmett Till, an African-American teenager whose murder in Mississippi in 1955 sparked protest in the South. Till’s death helped galvanize the civil rights movement in America, and Friday, August 28, 2015 marks the 60th anniversary of his murder. Till, 14, was kidnapped, beaten and shot after he allegedly flirted with a white woman. We are truly humbled and honored to be working with scholars and researchers such as Davis Houck, Devery Anderson, and Keith Beauchamp are donating their research materials to FSU and are willing to share their important work with generations to come. The collection will feature newspaper coverage from the Till murder trial and court proceedings by domestic and international press, and materials from FBI investigations, court records and interview transcripts. Author Devery Anderson will contribute a comprehensive collection of newspaper articles, genealogical work, interview transcriptions and obscure magazine articles used to write his recently released book, Emmett Till: The Murder That Shocked the World and Propelled the Civil Rights Movement. Anderson’s research not only tells the story of the Till case as it unfolded in 1955, but follows the case to the present day, incorporating the FBI’s investigation and source materials, including a complete trial transcript. Interviews and oral histories gathered by filmmaker Keith Beauchamp for his Emmy-nominated documentary, The Untold Story of Emmett Louis Till, will also comprise part of the archive. Beauchamp’s research was pivotal in convincing the FBI to re-open the case in 2004 — an investigation that resulted in more than 8,000 pages of important material. These materials from some of the nation’s foremost Emmett Till researchers will be a great addition to our archives and an outstanding resource for students, researchers and civil rights historians worldwide.